Microtrenching – Not for the big city. A disturbing new way to lay fibre-optic cable has emerged – it’s called microtrenching. In theory it sounds great, but in practice it’s a disaster, especially in a big city like Toronto. The theory is that you saw-cut a small slit into a sidewalk or roadway, slip a thin fibre cable into the slit, and then cover it with tar or mortar. Seems easy enough, right? The companies that sell microtrenching solutions promise dramatically reduced installation costs and less damage to municipal assets. The problem is that Toronto is a big city, with lots of utilities and lots of construction. 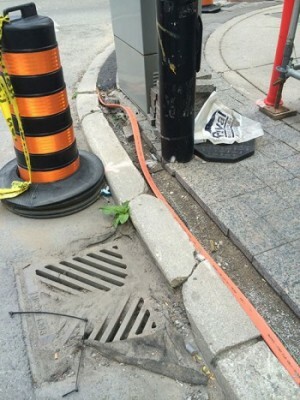 Sidewalks and roadways are continuously being torn up, and then replaced to accommodate our massive growth – and these little tiny fibre cables that are inlaid are very easy to damage. Included in this post are photos of a piece of microtrenched fibre that was accidentally exposed when the City was doing some curb work at a busy downtown intersection right in the heart of our financial district. Hundreds of thousands of pedestrians walk over this area every single day. Cars stop here, couriers walk on it doing deliveries, not to mention the construction company doing the curb work that has workers stepping all over it. Would you be comfortable with your Internet or telephone service running through this cable? What if the stock exchange or a bank had a critical link running through this cable? This cable that’s just lying on the street, in harm’s way. 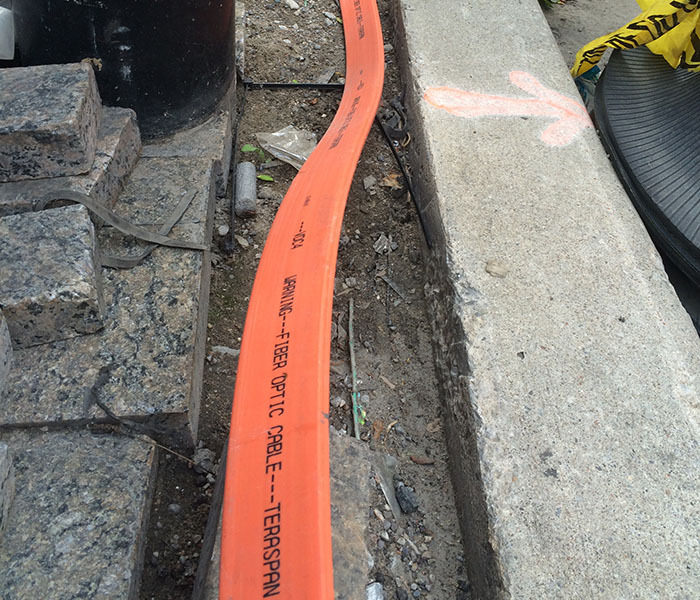 Microtrenched fibre is a threat to our city, our economy and the telecom industry. Thankfully, most of the up-start telco’s that use this dangerous construction technique have gone bankrupt, so its dangers haven’t caused any economic disruptions – but if it ever did gain traction, imagine the disruption to business in our city if these cables were carrying a multitude of businesses’ mission critical traffic, and were damaged? Microtrenching is a big problem for us at Beanfield for a few reasons. The first reason is that because we do construction properly here at Beanfield, we often find ourselves having to work around these little tiny fibres in our construction sites. It slows down our construction projects to have to work around these shallow cables, costs us more and causes more public disruption. When we have to excavate an area to lay a proper duct bank, we would normally get locates done, saw-cut the top layer, jack-hammer it up and excavate it. If we have to cross another utility (which often happens in a busy downtown street), we use a vac truck to suction the dirt and expose the other utility’s structure, and place ours safely nearby. This is not possible with microtrenched fibre. Since it is placed in a small slit in the top layer, then covered with tar or mortar, there is no way to vac it, or expose it. We have to either avoid the area entirely (which can be very costly), or it ends up getting cut by accident. 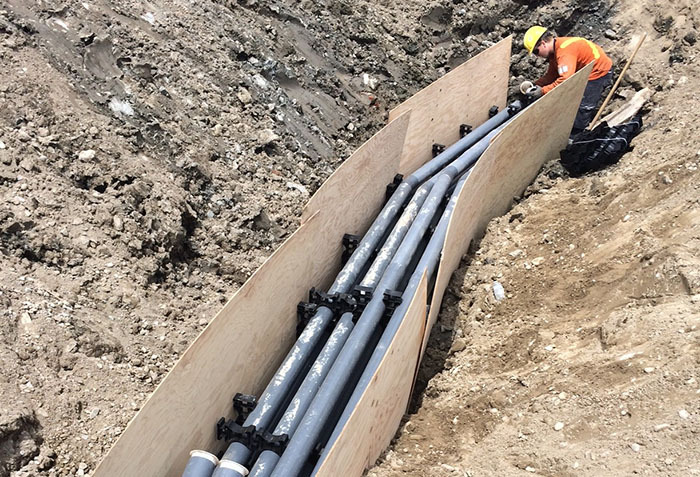 Microtrenching companies promise that they will attend any construction site to expose their cables when necessary – but the reality is that they aren’t big enough and don’t have enough resources to do so. Since the emergence of this technique, I have yet to see one of these companies actually show up when called to expose their cables. 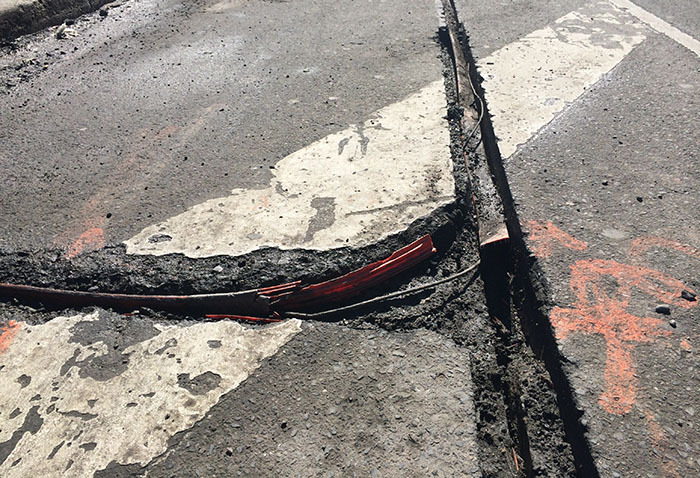 The following photo shows what can happen when microtrenched fibre is in the asphalt roadway, and the city has to come along to do road repairs. I was once on a construction site where they were doing road resurfacing. The City always assumes that all of the utilities are buried at least 1 metre below the surface. In this case, there was a microtrenched fibre in the asphalt. The construction foreman could do nothing to stop the little orange cable from being ripped up by the pavement ripper, and thrown out the back into a dump truck in little tiny pieces. This damaged cable took out dozens of customers. The telco that was using this fibre could not replace it for weeks, and these customers actually had no services for the better part of 3 weeks! The second reason is that when one of our competitors comes in and builds a route with microtrenching, they pitch their services to customers at much lower price points because their costs are so much lower. Of course they don’t tell the customers that they are buying services on microtrenched fibre. This eats away at the market price of our industry with an unsustainable and unworkable construction technique. Inevitably, competitors that use microtrenching end up going out of business because they have so many outages that their customers eventually give up and move back to companies like ours that use proper, more traditional methods. Believe it or not, it actually does hurt us when an up-start competitor in the telecom business has long and severe outages, and goes out of business. It makes telecom buyers (especially in large businesses) very nervous about dealing with smaller companies. These upstart microtrench-based companies will never tell their customers why they experienced such poor service and long outages, so the customers just think it was because the service-providers were small and didn’t have enough resources behind them, which pushes customers back into the arms of the big old companies. It’s up to us to try and educate our business customers about the dangers of this construction technique. The City of Toronto absolutely hates it; it causes them more headaches than anybody because they have the most utilities in the roadways, particularly the deep ones like water and sewers. They have been trying to find a legal way to prevent it, but as a government body they have limited power to prevent such things. The image below shows how a real duct-bank is built. It’s a minimum of 1.2 metres below the surface, sometimes much deeper. These ducts are placed, and then concrete is poured over them. 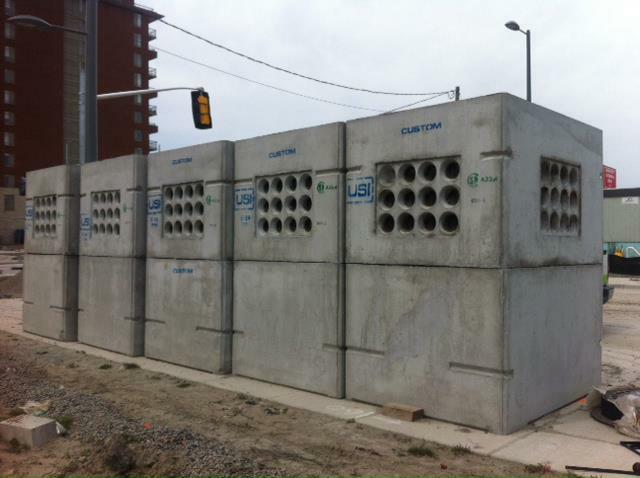 We bring these ducts into large concrete underground vaults, as shown in the picture below. We deploy these measures to keep all of this critical telecom deep, and out of harm’s way. Beanfield has not, and never will use microtrenching. What this article should have focused on was the actions of startup telcos that are micro-trenching in such an irresponsible manner. This is less an issue with the technique of micro-trenching, as it is with the unscrupulous actions of a penny pinching start-up. Your method, the ducting method, i.e., the industry standard, is not without it’s own challenges. It is heavy handed, requires more time to go live and is significantly more expensive and disruptive. It negates the promise of fibre for the average person due to the exorbitant costs involved. The consumer should own the last mile, and for that to happen, cheap & fast fibre laying solutions like micro-trenching are required that disrupt the establishment. It is only when the consumer controls the last mile will be true competition amongst the telcos. Competition is what Canadians desperately need in our telco market.